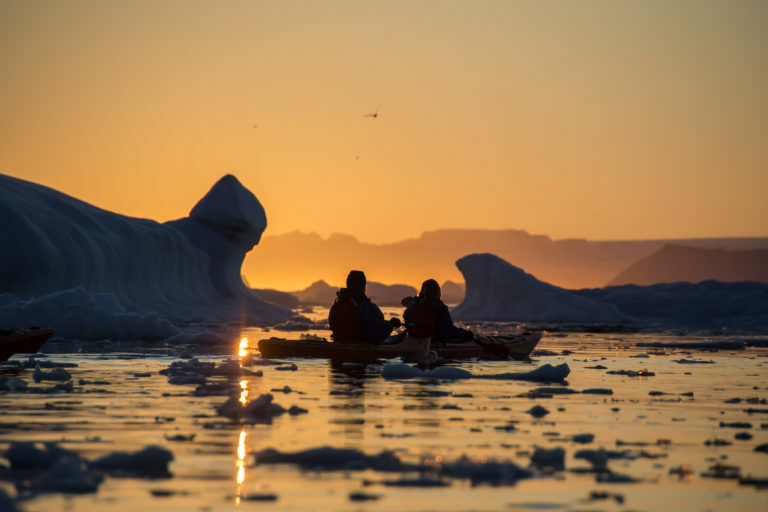 Experience the magic of the Midnight Sun as you paddle between the icebergs. There is nothing more magical to see than the constantly changing colours of the midnight sun as it reflects off the broken ice that floats in the Greenlandic waters around Disko Bay. From pink and purple to yellow and orange the ice will enhance the glow of the sun that never sets in the Summer time. In this amazing experience you will enjoy a kayaking experience where you will be helped into your kayak by your guide and set off in small groups to explore the water in the evening. You may be lucky enough to see a variety of wildlife including sea birds, seals and even whales as you paddle through the icebergs!